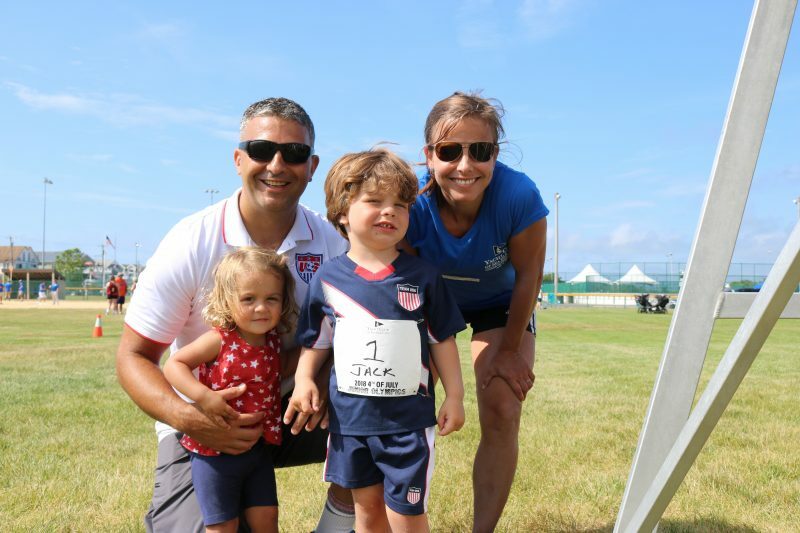 Jessica and Tim Loftus, and their children Mackenzie, 4, and Ryan, 3, gear up for fun at the Junior Olympics. “He thinks he is throwing a baseball,” the 3-year-old’s father Tim Loftus, of Philadelphia, said with a laugh. 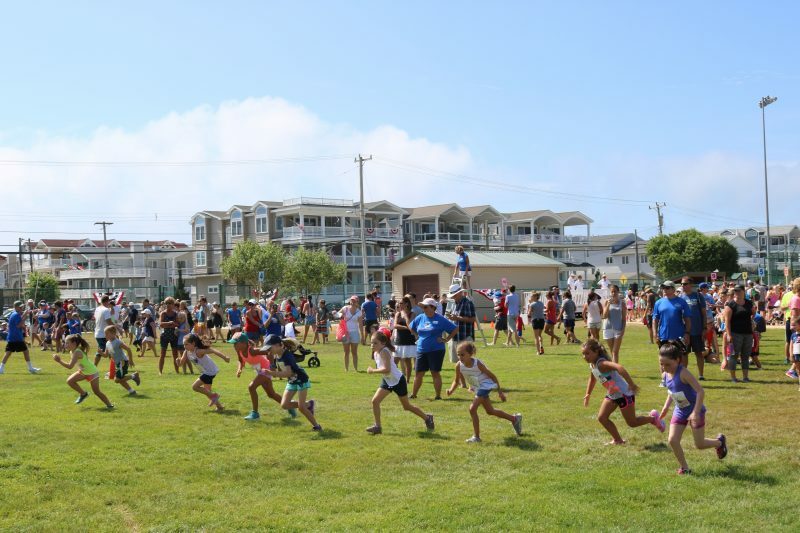 Ryan was practicing his form for a tough beanbag-tossing competition during a Junior Olympics event held at the Dealy Field athletic complex in Sea Isle City Wednesday. 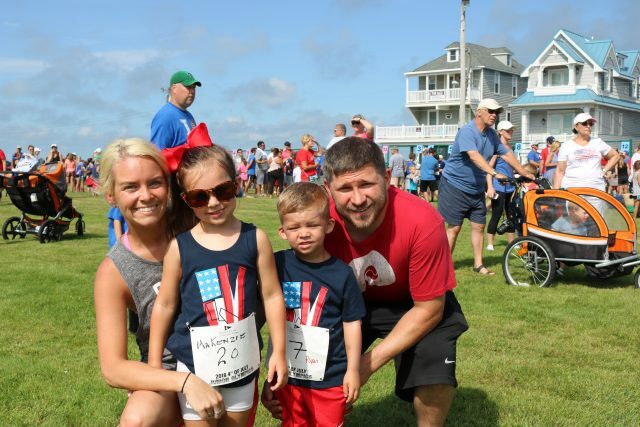 The little boy was joined by his sister, Mackenzie, 4, who was gearing up to run a race later in the morning. Running is serious business in this friendly competition. 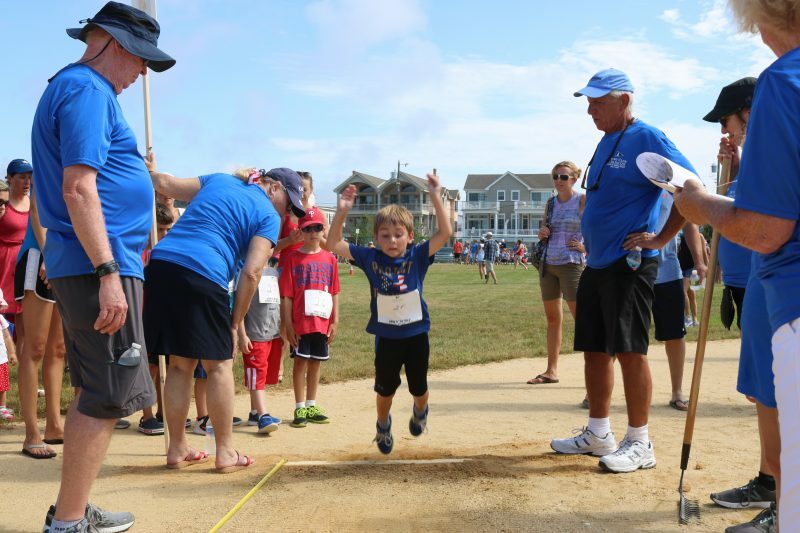 Nearly 500 children from ages 3-13 showcased their athletic skills with beanbag-tossing competitions, sprints and the long jump. All the participants received a ribbon but the winners in each age group received gold, silver and bronze medals, while standing on a victory platform. 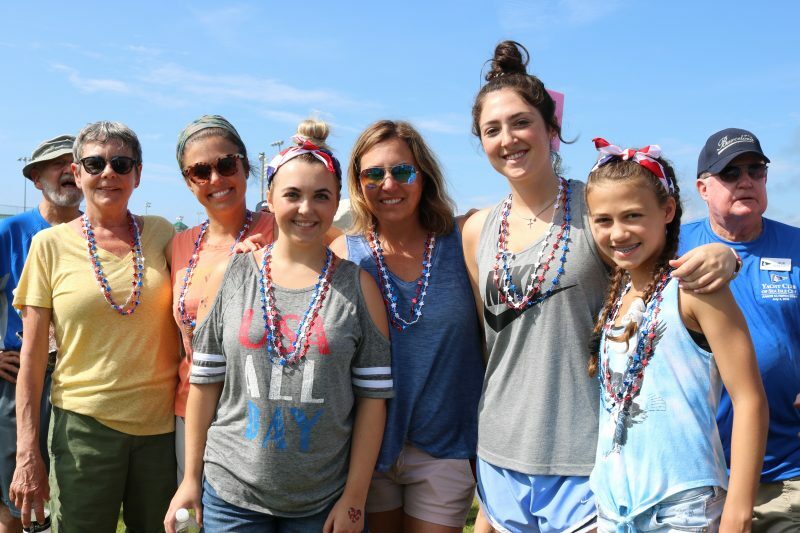 The yearly event starts off the city’s Fourth of July celebration with family-oriented activities the city is known for putting on. People also filled the beaches and fireworks were planned for the evening. Kids lined up anxiously awaiting the call to toss, race and jump. Katy Wendt lives in Chicago, but visits family in Sea Isle every summer. She said her children look forward to the Junior Olympics every year. Miles Wendt, of Chicago, is patient in the No. 1 spot for a race. Her 4-year-old son Miles Wendt stood patiently in the front of the race line, wearing the number one on his shirt. Other kids behind him fidgeted a bit. One child told another that he wasn’t in the right place. In a few moments the runners were off in a flash to the finish line. The children weren’t the only ones gearing up for competition. The Junior Olympics in Sea Isle is a family tradition for David and Kelli Velez and their children Finley and Jack. Kelli Velez sat in a Lifeguard stand and surveyed the crowd of kids. “My title is beanbag-toss lifeguard,” Velez joked. She has been a volunteer with the event for about five years. “I have had the same title since I started,” Velez said. She took a moment to come down from the stand, just before the call of the toss, to visit with her husband, David Velez, and their children Jack, 4, and 1-year-old Finley. 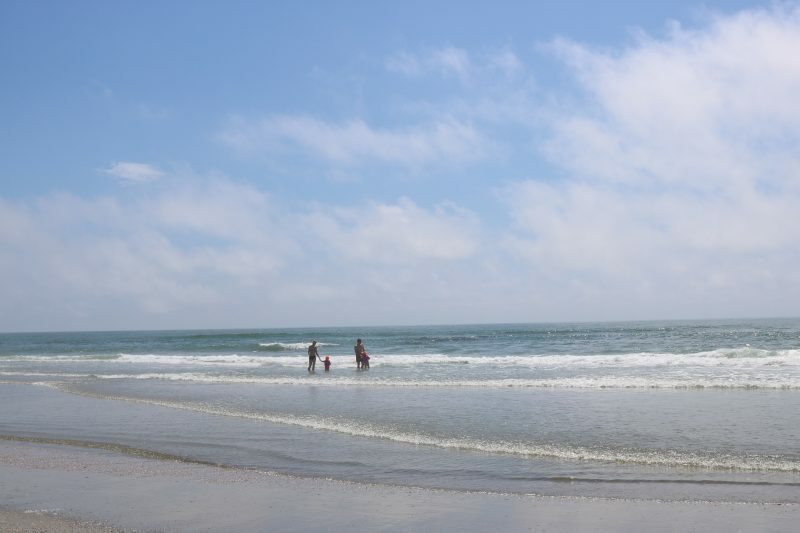 The family spends summers in Sea Isle with family. Like many families who filled Dealy Field, they make the Junior Olympics a Fourth of July tradition. “It is a great event for the kids. My son is going to be in a race soon,” Kelli Velez said. The long jump is a popular event among kids at the Junior Olympics. 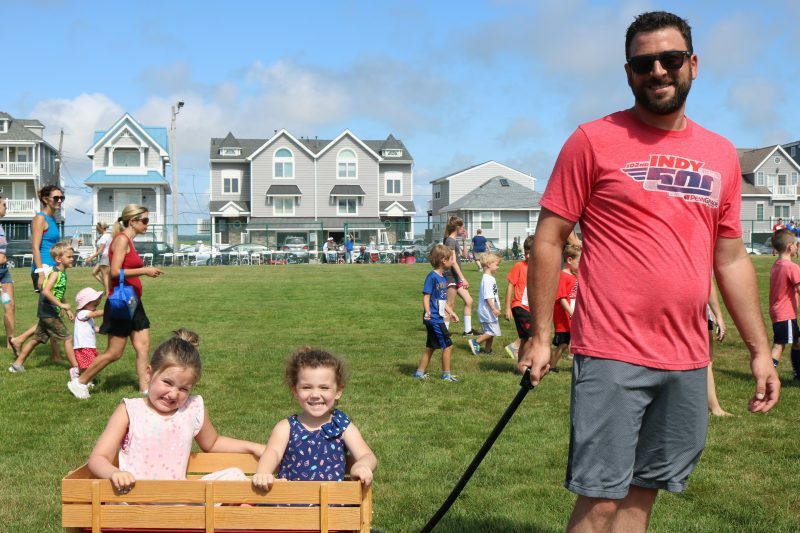 The free event is sponsored by the city and is hosted by a large group of volunteers from the Yacht Club of Sea Isle City. Jamie Mulholland, co-chair of the event and a former commodore at the Yacht Club, said a lot of work goes into putting on the Junior Olympics and every year it is worth it. She couldn’t recall how long the event has been in existence, but she said she wants to research it. Mulholland said she knew she had to help every year, after a young man stopped her on the street years ago to thank her for the event. He told her he looked forward to it and said how special it was to his. “It still makes me emotional when I tell the story,” she said. Mulholland noted that 150 volunteers from the Yacht Club make the Junior Olympics a success. “Years ago, people would show up the day of the Junior Olympics to help out. You see how many people are here,” she said. Every year the YCSIC organizers implement new ways to make the event more efficient. Once the event is over, Mulholland said yacht club volunteers begin planning for the next year. 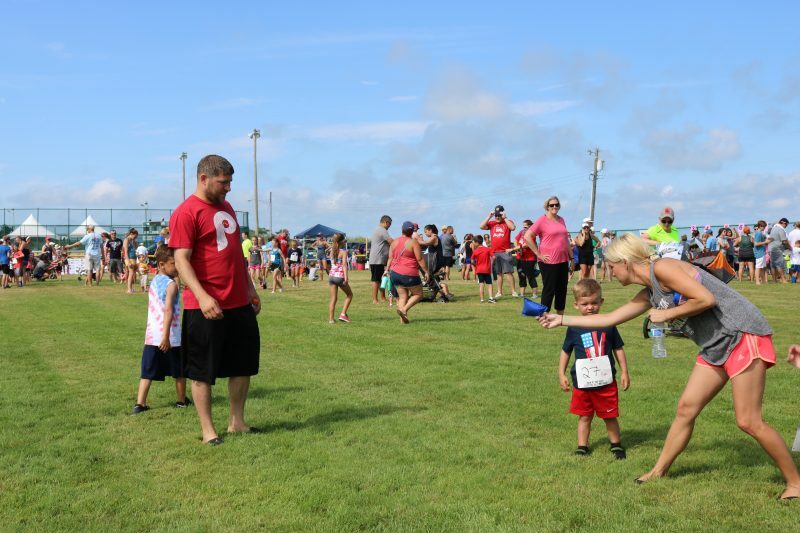 Tim and Jessica Loftus, of Philadelphia and Sea Isle, practice the bean bag toss with son Ryan. 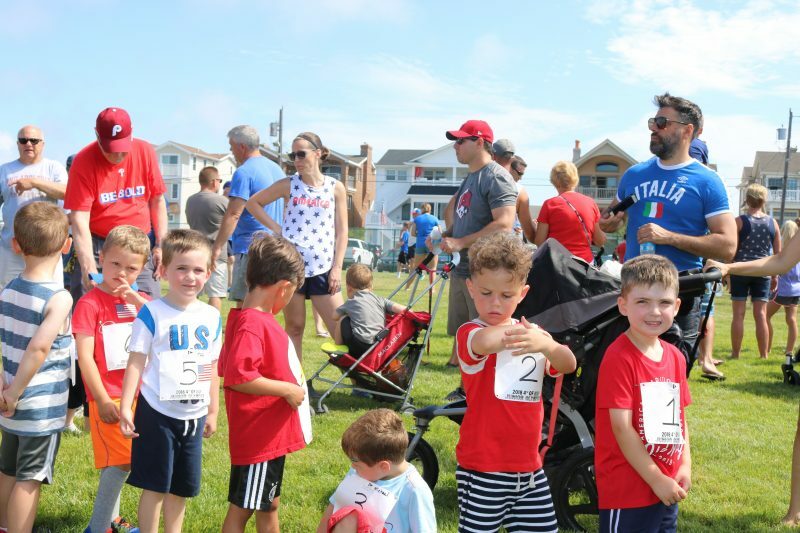 Barb Norcini, Jessica Mullholland, Jen Bradley Alexis Viviani, Claudia Kriza and Kylie Mulholland say the Junior Olympics is a great start to their family vacation in Sea Isle. Kevin Forbes, of Pennsylvania, takes his daughter Harper, 3, and her best friend, Malin Miksit, 5, on a wagon ride. 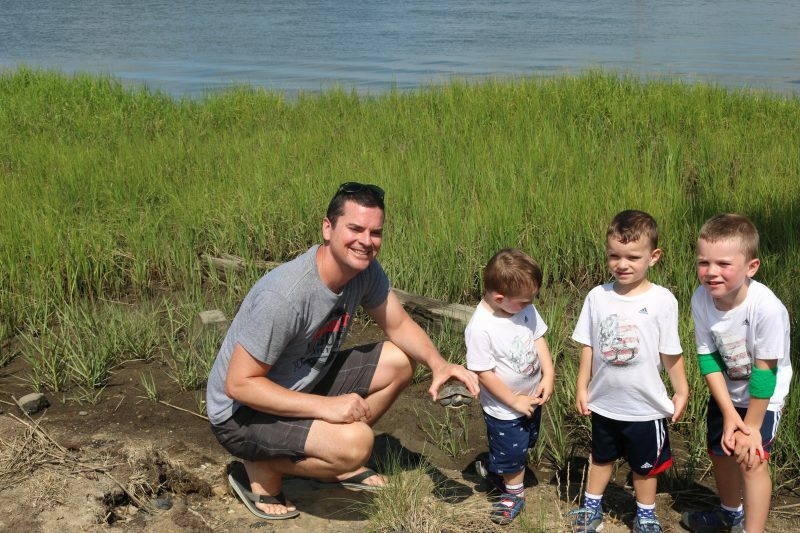 Leaving Dealy Field, Kevin McFee and sons Lochlan, Finn and Braedon, carefully put a turtle back in the marsh in the direction it was going after finding the terrapin trying to get through a fence at the complex. Some people chose the beach over the athletic fields July 4. 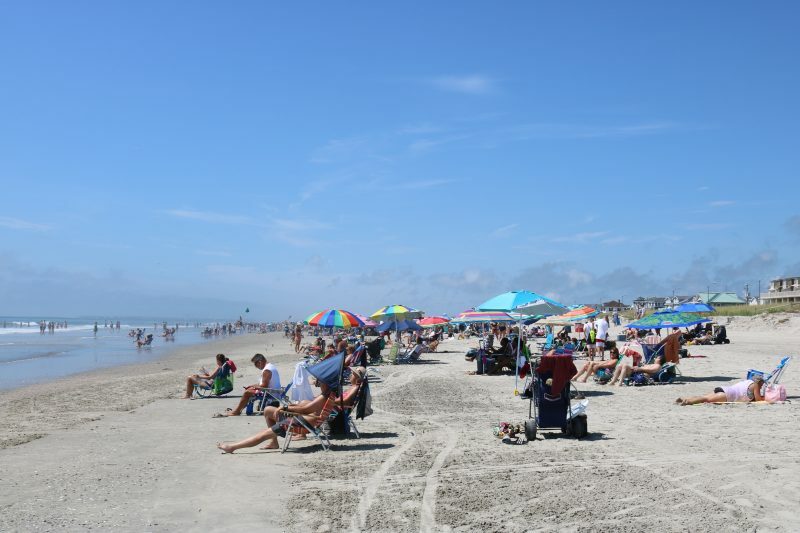 Beachgoers flocked to the beaches to enjoy a cool dip and bask in the sun. Some beachgoers took a dip.